Well, a year ago I wrote this piece begging Mr. Nadella to stop the misery and kill Windows 10 Mobile and for some unknown reason, he didn’t read it. Ok, I get it. he is in denial. But in 1Q16 the Lumia line in Microsoft got an alarming decrease in sales of 73%. If that doesn’t make you quit, I don’t know what will. A year ago I thought i was going out on a limb, but it does seem like the market agrees with me. A rare occasion … let me just enjoy it for a second … OK, that’s enough. Let’s make a little bit of history, shall we? the Lumia line came to Microsoft as the difficult to understand acquisition that Ballmer made as a parting gift back in 2013. I wrote about that too at the time. It was a questionable acquisition from the business perspective. Nokia mobile was losing money and had no sight at becoming profitable. However, if you have money up the wazoo and are the perceived leader in technology, can you afford not to participate in mobile? Nokia was the last standing soldier developing mobile phones using Microsoft’s OS. Rumor has it that they had threatened to go Android in order to recover a position in the market share. So what’s a rich company to do? Ballmer had 2 choices: let Windows Mobile die with Nokia going to Android, or plunk out an insane amount of money for a business that was losing money. Obviously, he chose the latter, $7.2B for a shrinking business that lost money. But it became Microsoft’s “right to play” in the mobile world, by far the largest computing platform of this decade. Mr. Nadella wrote that investment off back in 2015 without a lot of explanation. I guess the first quarter of this year explained it. It does seem clear that Microsoft has not been focused at all in Mobile and are now a distant, or even negligible player. Just to put things in perspective, Microsoft sold a little over 2 million phones in 1Q16 (fiscal 3Q16). Apple sells that amount in less than a week, and there are more than 2 million Android phones sold every day in the world. Yes, seriously. Imagine if you are one of the unlucky people who happened to buy one of the 2.3 million phones? Who is going to write apps, who is going to be my phone buddy? So, please, Mr Nadella, the world begs you to kill this walking dead. My loyal reader (singular), please tell Mr. Nadella to help the industry out and do like RIM and go Android. The world will be a better place with one less OS to distract developers. Well, it was just a matter of time. 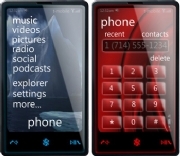 PC World reported that Microsoft will announce its own smartphone in the World Mobile Congress in Barcelona this month. I guess the pandemic of iPhone envy is hitting everyone hard. This one promises to be interesting since it will allegedly be based on the Zune music player and the Windows 7 Phone platform. All good. Until now Microsoft’s strategy was OEM friendly. LG, Samsung, HTC, Motorola and others have introduced Microsoft based smartphones of varying success positioning Microsoft’s mobile OS as the 4th player (soon to be 5th thanks to Android) in the smartphone category (after RIM, Apple, and Symbian). This strategy represents a hardware/software branded device from Microsoft in a sense competing with its own OEMs. All those companies however have not shown any loyalty to the Redmond folks since they have diversified or totally migrated to the Android platform. So I guess Balmer decided: Screw them I will go Google … sorry I will do like Apple … not really, I will do my own hardware and control my own destiny. Good move? We’ll see. But definitely not a bad one or a move that will damage any OEM relationships. The world is ready for a diversity in OSs and the smartphone category is the fastest growing category in the industry. Microsoft cannot afford to be the fifth. The question is: Will this make a difference? Not likely. Microsoft has by far the largest market share in the enterprise – with “big Windows”, not smartphones, that privilege belongs to RIM. It boasts millions upon millions of applications and it is the “standard” enterprise Operating System. These are not 99 cent apps, no! These represent real money for enterprises and Microsoft. A simple copy of Office may go for hundreds of dollars. Why? because it is the defacto standard (for now). The smartphone world behaves very different. With the exception of email and a couple of minor “connectors” to ERP systems there are very few apps for the enterprise. In fact Windows Mobile today has the largest number of enterprise ISVs (Independent Software Vendors) but they specialize in niche applications like inventory, supply chain, delivery, fleet management, etc. The devices these apps run on are not your typical HTC smartphone Fender edition but very specialized hardware made by Motorola and others. The thing is: The Microsoft name, which carries a lot of weight in the enterprise, does not represent a mayority choice for the consumers as it does in PCs or in those niche applications. The perception of a “standard” OS with millions of applications does not exist in the Smarthphone world. There are millions of apps for several OSs, in fact lots of apps are available for most smartphone OSs (paradoxically Windows Phone is typically the last one to be developed). So my contention is that even if Microsoft comes up with a killer device it is an uphill battle to go after RIM, iPhone, Symbian, and Android. It may much better than OEM versions since Microsoft has intimate knowledge of hardware and software to make it so, but it will hardly take the world by storm as its competitors have. Good luck Microsoft and thanks for giving us all something to write about and for another great opportunity for a clever Apple commercial. I’m sure there’s a map for that somewhere. Although it may sound a bit cliche, the success of a company (or any enterprise for that matter) depends on its leadership. It not only depends on their ability to inspire action but also in the leaders’ ability to paint a picture that people can relate to. I recently bumped into a post by an ex colleague that clarifies the point very eloquently. He comments that leading visions must be clear, compelling, and credible for followers to act on them. I agree. However execution is a key element for any leader to succeed. Technology for the rest of us. June 19, 2009 by lfllmg · Comments Off on Technology for the rest of us. If you’ve gone to a Home Depot recently you will notice a couple of changes. First, an eager greeter at the entrance (reminiscent of Walmart) may hand you a flier along with a clever remark that makes you not only pay attention to him/her but you actually open the flier. Weird! Second, if you are browsing along the chainsaw aisle staring at the multiple HP machines in front of you someone with a friendly comment will actually offer help. What a concept! Customer service. Who thought of that? Apparently it takes a savvy business person like Marvin R. Ellison, Home Depot’s brand new CEO to come up with something like that. Back in May, Business Week ran an article highlighting the second largest retailer’s in the US new strategy .